Cheap and best AC servo motor drive with 15A rated current, three phase 220V AC, provides position control, speed control of control mode, is suitable for 400W to 1000W power rating servo motor. High precision 500 Watt AC servo motor with lower cost, 3000 rpm, 1.6 Nm rated torque, available in a 80mm square flange size. It is widely used in factory automation, embroidery machines, printing machinery, CNC machine, wood carving and other fields. The 3A 220V AC brushless servo motor, 1hp (750W) power rating, 2.39 Nm rated torque, peak torque of 7.1N.m, peak current of 9A, rated speed of 3000 rpm, 2,500 PPR incremental encoder attached. Low cost and high speed servo motor, manufacturer direct sale. 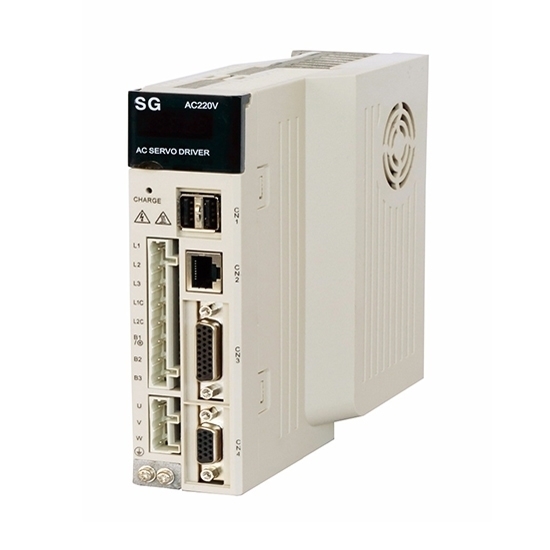 AC Servo Drive for 400W-1000W Servo Motor can perform quick positioning operations over a short distance without the need for tuning, while providing smooth performance. It is widely used in CNC machining equipment, food processing machine, material conveying equipment, medical apparatus and instruments, textile machinery applications and so on. Servo drive should be fixed in the control panel. A cooling fan should be added when the ambient temperature is high enough. A servo drive which has been put into use is forbidden to do withstand voltage test. Before the machine running, a right driver should be selected to match the motor. The binding posts of driver's U, V, W should be in one-to-one correspondence with the motor terminals U, V and W. Completely different from asynchronous motors, it is prohibited to reverse the motor by replacing the three-phase terminal. The power through servo motor is high frequency current. For this reason, the leakage current of a servo motor is relatively large. The motor's ground terminal should be connected with the servo driver's PE connector, and grounded well.